The Novatank from Flexitank is a collapsible 5000 litre water tank that applies the space saving principals of a flexible bladder tank into a sturdy yet manoeuvrable product that can be transported and assembled into almost any position or location. 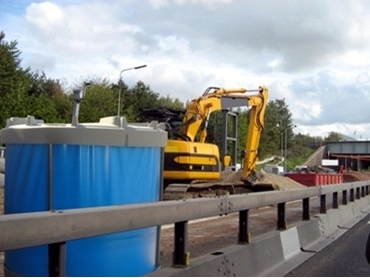 The Novatank is constructed from a thermoplastic liner and galvanised steel frame and boasts to use as little ground space as is physically possible. Built to for both industrial and domestic applications, the Novatank was recently featured on the ABC's New Inventors Program. While the collapsible tank holds 5000 litres of water, the innovative design of the Novatank means it is just 42cm in height (when packed down for transport) and weighs just 100kgs (when empty). This allows the collapsible water tank to be efficiently moved through narrow pathways or stairways, hilly areas and even in bushland. The collapsible tank is designed to be assembled and filled, then emptied and collapsed on a regular basis. The ease of transportation and assembly means Novatank is also perfect for a variety of situations including outdoor events, pool repairs, and tank repair & cleaning. While the Novatank design will make it easier to install in tricky locations, the greatest feature of the Novatank is the flexible plastic liner. Made from the highest quality fabric the liner meets every international drinking water standard when plastic is in contact with water.